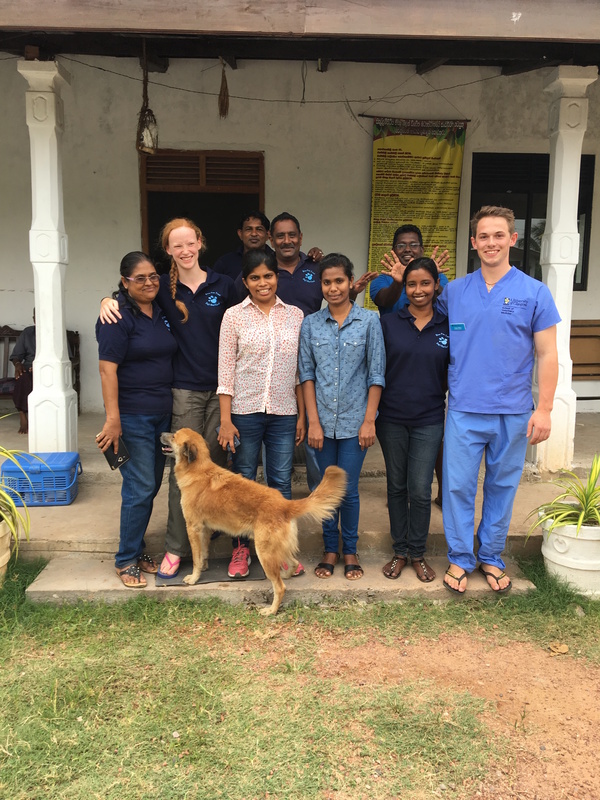 We are very privileged to work with the Blue Paw Trust (BPT) which was set up in 2003 to provide free or low cost spay/neuter programs and other services based on population control efforts towards eradication of rabies from Sri Lanka. Subsequent to the Tsunami of December 2004 the fear of rabies outbreaks spread throughout the affected coastal areas and BPT – in collaboration with WSPA – operated two mobile veterinary clinics to sterilize and vaccinate dogs in these regions. Due to the success of these projects, in 2007 WSPA invited the BPT to carry out a landmark 5 year dog population management and rabies control program within the city of Colombo under the ICAM coalition guidelines. From 2007, 6 veterinary surgeons and 3 animal control operatives plus 1 community liaison officer made up the field team under the supervision of Dr Nalinika Obeyesekere. The Main BPT ‘s Colombo project with WSPA ended successfully. 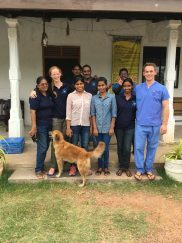 But they decided to continue with student training which is aimed at continuing the rabies control programme plus the sterilizing of the animal population as a follow up of the previous project in the Colombo Suburbs in under serviced communities. This project work partly funded by the money paid by the students to supplement the deficit in public funding, plus any donations received along the way to assist with this work. BPT are actively looking for outside sponsorship for this programme. The mobile clinic lorry is set up. Every dog presented to the clinic is thoroughly evaluated to check whether they will be fit enough for surgery. This is done by means of history taking and clinical examination. If deemed fit for surgery the animal is then sedated and given the appropriate pain medication. The surgical site is disinfected. Intravenous anesthetic protocol or gas anesthetic protocol is used depending on the dog’s status. Every animal is intubated before surgery. Pre operative antibiotic, post operative antibiotic, pain killers and fluid therapy are given during the surgery. All surgical packs are sterilized in the autoclave. Sterile gloves, surgical packs and new scalpel blade are used for each surgery. Three clamp technique is used to remove the ovaries and the uterus. Subcutaneous suture pattern is used to close the skin of the sterilized dog and the animal is kept in the post operative recovery area until it is in sternal recumbency and is calm. Before the animal is handed back the owners are given post operative care information verbally and by means of a handout with contact numbers in the event of post operative complications. Tattooing the inner right ear and notching of the upper margin of the left ear as a U shaped incision makes it easy to identify sterilized dogs. BPT’s mobile veterinary clinic is of particular interest to 3rd, 4th and 5th year veterinary students who have the opportunity to practice their skills under the guidance of a qualified veterinarian. It is a hands-on experience and each student can learn and experience as much as he/she wants to. Only 2 students are taken at any one time to ensure high quality personalized training. 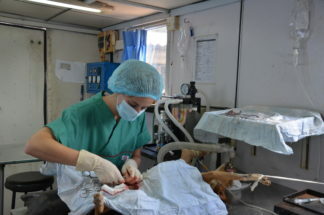 Each student is assigned to a highly competent veterinary surgeon during the entire period of training. The student is first guided (depending on his/her abilities) to do surgeries and towards the latter part of training is allowed to perform surgeries under direct supervision. Students will do a minimum of 3 surgeries per day depending on time availability and efficiency. The BPT charges for training and supervising students and this is included in the project price. It does not go directly to the Veterinarians but is used by the BPT to further their work in the local community, pay for supplies and equipment and so on. The BPT has a large twin bedded room with Air conditioning and en suite. There is a comfortable lounge and a outside terrace. There is a kitchen where students can self cater with a microwave, fridge, toaster and cooker. Food is NOT included in the price of this project and is at the students’ cost. Packed lunch can be taken with you and in the evenings students can choose to eat out at a local restaurant or cook in by using the self catering facilities. Students should fly to Colombo International Airport where they will be met by a representative of BPT and transferred to the BPT. At the end of the project students will be transferred to Colombo airport. During the project students will be transferred as necessary to their place of work. Students need to start work at 06:30 am on the Monday morning therefore we suggest students arrive on the Saturday to get used to the heat and get over the jet lag! Work starts early and finishes early around 3pm. Students then have free time. On weekends students can visit, the Southern Beaches(Benthota and Hikkaduwa), Archeological sites (Anuradhapura, Polonnaruwa, Sigiriya and Dambulla), Hill capital Kandy (Temple of the Tooth Relic, Botanical Gardens of Peradeniya and University of Peradeniya), Wildlife Reserves (Yala National Park) and the list is endless. All these excursions will be at the students’ own cost and should be arranged by the students. Accommodation, transport to and from the airport and to the project each day, training and support from BPT staff during the project and any project materials. Flights, food, travel/medical insurance (please check links for Insurance information), vaccinations (rabies IS compulsory), visas, excursions on days off, luxury items such as alcohol or chocolate etc. £1500 PER PERSON based on 2 STUDENTS SHARING for a minimum of 30 surgeries in 2 weeks. £750 PER PERSON for 1 week based on 2 STUDENTS SHARING for a minimum of 15 surgeries in 1 week. This option is only available if students can already neuter male cats and dogs before the project starts. We still have some spaces available – please ask. £1580 PER PERSON based on 2 STUDENTS SHARING for a minimum of 30 surgeries in 2 weeks. £790 PER PERSON 1 week based on 2 STUDENTS SHARING for a minimum of 15 surgeries in 1 week. This option is only available if students can already neuter male cats and dogs before the project starts.